Professional and courteous service is a priority at Ralph Joseph Onesti Piano Restorations. We have enjoyed a fine reputation both on and off the concert stage, institutionally and in private homes, for over four decades and proudly are rated 'A' on Angies List. Our office maintains permanent records for every piano serviced and attempts regular phone contact with each client on a twice yearly or individually chosen basis. We provide tuning and service for privately owned pianos, institutions, churches and commercial venues. Call 610-833-1657 now for a convenient appointment. Click to view RPT certification (center graphic), use browser back arrow to return here. Assistance in finding a teacher or piano mover. While completing a tuning procedure, Ralph will also inform the client as to the current condition of their instrument, noting observations and suggestions for further service on the service order. A permanent, detailed record is kept of each appointment. Basic maintenance tuning, at the client's option, is normally scheduled twice yearly or every six months. Please read the next description if your instrument has not been tuned in over one year. The piano may first require one or more pitch correction procedures before it can be tuned. This is necessary when the pitch of the piano in question has moved more than 7% above or below A440. This condition varies with individual pianos and may be expected if the piano has not been serviced for a long period of time or has been exposed to extremes in temperature and humidity. The process is the same as that performed in tuning, however, it may need to be repeated in order to obtain the proper pitch and stability. This is an issue of great importance and worth mentioning. In our history we have never felt it necessary to approach our clients with a service contract. We have serviced several school districts, churches, many commercial clients, and numerous professionals, as well as privately owned pianos for many years. We have developed a mutually beneficial and comfortable relationship, with superior service, on an as-needed basis. Contracts leave little control in the hands of the client as to who will be servicing their piano and less if they become dissatisfied or uncomfortable with the service entity. They are bound until the contract expires. Regular servicing by the same individual, backed by diligent record keeping, allows for consistency and familiarity with the instrument, thereby insuring stability. Conversely, the piano owner who changes or chooses a technician based on price alone is doing themselves and their piano a great disservice. Call 610-833-1657 now for a convenient appointment. Time and materials, charged by the quarter hour when provided at a scheduled Tuning Appointment. When provided as a separate Service Call; one hour minimum, charged by the quarter hour thereafter. Upon approval from the client, the technician is prepared to complete any necessary repairs including but not limited to: action adjustments, string replacement, tuning pin replacement, lubrication of action parts, easing keys, minor regulating and voicing (please see information below regarding regulation and voicing procedures). Time and materials. Regulating the action is an involved, inter-related process. It is the key, when pressed, which brings the hammer into contact with the string. Between the key and the string, when one adjustment is made, another may be necessary to compensate for the first and so on until the proper efficiency is achieved for each individual key. The process can take several hours to an entire day. The end result of voicing is to achieve a uniform sound as the hammers strike each note throughout the piano. Given the intended use of the piano and the personal style of the pianist, this area is subjective. Consideration must be given to the individual instrument as well as the construction of the action parts. Where a thorough voicing of the entire instrument is warranted, extending the life of the action and enhancing the playing, the owner can expect the procedure to take an entire day. Time and materials. The process may require several hours. An hourly fee applies. Provide the technical service necessary to render the piano in tune to the best of its ability. Leave the piano, within the time permitted and according to the piano's condition, as playable as possible. Voicing will be accomplished according to the subjective taste of the artist. If the artist's input is not available, the technician will use their own discretion. Refer to Concert Preparation above. The piano's reliability and use of recording will always be the objective. In case you'd like to hear some of our work; the homepage and it's link to the site information page both have cuts from a recording session in which Ralph Onesti prepared the instrument. The piano will be closely examined. The action is pulled for visual inspection; torque readings are taken to determine the pin block's ability to maintain a normal tuning procedure; the ribs, soundboard, bridges and strings are observed and condition noted, as well as the condition of the finish and case parts. As a result, a fully detailed report is compiled. This report will advise the owner of the approximate original purchase price and current worth, and what it's enhanced value would be with restoration. There will be no question whether the instrument is, or is not, worth the financial investment.This evaluation will also prove useful for purposes of insurance and resale. Contact us by phone or email at appraise@onestipiano.com to arrange an appointment. Please read the paragraph regarding Rebuilding below. The piano will be inspected and observations noted, similar to the evaluation process above. Suitable for obtaining the proper insurance coverage for the piano or for substantiating the piano's current value for purchase or resale. Contact us by phone or email at appraise@onestipiano.com to arrange an appointment. Occasionally we are called upon to observe an instrument that has sustained damage due to water, fire, moving, etc. We will provide your insurance company with the necessary factual details in order to process your claim. Ralph Onesti is registered nationally as an Expert Witness with the Technical Advisory Service for Attorneys, TASA. Handled through the office, as a scheduled appointment, we will be happy to observe any piano, private sale or retail, being considered for purchase. The value of an unbiased opinion goes without question. We are not a retailer, so this service does not benefit us other than the service fee that is charged. Contact us by phone or email at appraise@onestipiano.com to arrange an appointment. Today, over 400,000 pianos worldwide are protected from humidity fluctuations by Dampp-Chaser Piano Climate Control Systems. Endorsed by major piano manufacturers, the system is installed virtually out-of-sight inside the piano to lengthen the instrument's useful life. With a Dampp-Chaser System, shrinking and swelling of wooden parts is minimized, the pitch stabilizes, tonal quality and touch improves noticeably, and the piano's investment value is safe-guarded year after year. Systems must be installed by professional piano technicians or manufacturer's warranties will be voided. Ralph Joseph Onesti, RPT, is an approved and Certified Installer and Field Expert, of Dampp-Chaser Climate Control Systems. If you have invested in the purchase of a piano, does it not make sense to protect your investment? All of our clients are made aware of how humidity or the lack of, combined with variations in temperature, affects the performance and stability of a piano. Did you realize that the most expensive home air conditioning system will do nothing for the piano? We encourage and educate our clients on the use of Dampp-Chaser Humidity Control Systems for their pianos. To visit Dampp-Chaser's informative and illustrative website click here! But please use Back in your browser to come back and learn more. For grand pianos, we also strongly suggest the use of a Custom Grand Piano String Cover. This lightweight cover, made of the highest quality woven wool, will protect the strings and board from dust, animal hair or other debris (the accidentally spilled beverage). Its use will not dampen the sound and built in batons keep the cover off of the strings entirely. Each attractive cover is custom fit with serged edges and decorative stitching. It is available in several colors with coordinating trim stitching colors to match your piano and decor. When used in combination with a properly installed climate control system, you have the ultimate in protection for your piano, far beyond what any home environmental system could provide. As an incentive, we will discount both when purchased at the same time. So you're having your piano rebuilt, or thinking of doing so. How will you make sure it's being done correctly and by a qualified shop? We will provide you with a list of exactly what should be done to your piano, and then visit the rebuilding shop a minimum of three times to make sure that everything on that list has been accomplished...correctly. We will review the contract with the rebuilding shop BEFORE you sign it and any money crosses hands. We will review the warranty to make sure that you are protected. And if anything goes off track and it becomes necessary, we will be there for you and your attorney at all stages of the legal process. Trust me, when a rebuilding shop sees that you are protected one of two things happen; they refuse to do the job, or...they do it right. This public service program is available to universities, music institutions, retailers, manufacturers and other special interest groups with ample notice. "The Other Side of the Keyboard" educates and informs, in Ralph Onesti's entertaining style, the novice to professional, familiarizing all with the 'nuances' of the piano and how to communicate your needs to your technician. - I never forgot the meaning of service...it seems to be gone these days. - I never forgot the meaning of the word courtesy...my dad taught me to be a gentleman at all times. - I never forgot the work ethic. Honesty in my business is the foundation of my business. In fact, I like the term "work ethic". You can't teach that...you get that from the start, when you're very young. - And, I never forgot the meaning of the word work. I find it a pleasure to get up every morning and do what I love. Before we go any further, it's probably prudent for you to be aware of my background so please click here to view my bio. Although I can make many claims in my 48 + years of experience in this business, there is one claim that escapes me - I can never claim that I was ever a great pianist, nor did I ever play in a famous orchestra, jazz trio, or band. I'm not really sure what relevance that has, but some technicians use their musical experience as a basis for their piano technology "claim to fame". The fact is, while those individuals were singing and playing in bands, orchestras and the like, I was backstage making sure that the piano involved was properly prepared and the best it could be so the orchestra had what they needed to entertain. While those same individuals were studying their instruments I was honing my skills as a piano technician, working for the orchestras, bands, singers, and trios in which they played. I've been doing that since 1964. Can you remember where you were in 1964? I was servicing pianos. To this day, the same passion that started me down that road as the backstage "help", getting me where I am today, still lingers. I do it because I love it. What I won't ever do is make an appointment, then send an apprentice level individual in my place. When you make an appointment with Onesti Piano, you get Onesti. 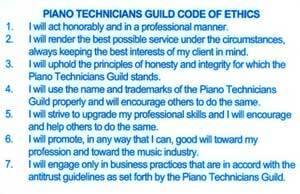 Further, since the only way one can prove their worth as a piano technician is to join the Piano Technicians Guild and become tested and registered, I did so, and I make sure I carry the only credential I need...please take a look at the following. It's always in my wallet and my certificate hangs on my office wall, and I'm proud of it. 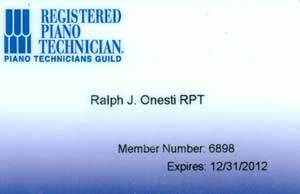 You can visit the PTG site to see if a technician is a Registered Piano Technician (RPT). 2018 still holding my Registered Piano Technician status. Please don't be afraid to ask to see my RPT card...I'm proud to show it off! Call us now for a convenient appointment at 610-833-1657. Please go to the Maintenance Tips, and Piano Talk pages for care guidelines and terminology to assist you in communicating with your technician. If you require further information regarding our service or wish to set an appointment, please feel free to contact the office by phone or email your request to service@onestipiano.com.